This past weekend Esther and I went north to attend a wedding in Vancouver BC. We also got to care for Ada as her parents rushed back and forth across the Canadian border, helping with the wedding preparation and entertaining out of town guests. Aaron Castle is a good friend of Bjorn's from college and Amy Neilson is good friend of Jenny's. Each couple claims that they are responsible for getting the other couple together. 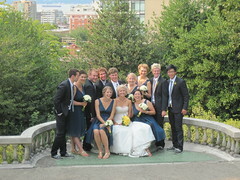 The wedding was at a stately mansion on the south side of Vancouver. The grounds and facilities made an elegant wedding setting. We also got to spend time with Esther's family and an evening with Doug, Pam and Ellen. Another highlight of the weekend was a progressive dinner at Marti and Mike's to celebrate Esther's birthday. Marti had five different tables set up around the property, each with a unique set of decorations. The six of us rotated around the tables enjoying the scrumptious courses. It started with clams and mussels in the shell, Italian soup, fresh garden salad next to the garden, salmon with cooked vegetables carefully selected from the garden by each guest, and topped with Martha Stewart's icebox cake by out door candle light. Needless to say, it's going to take a lot to top that meal.